Cotswold Hares are coming to Dursley as part of Cotswold AONB’s 2018 Hare Trail. The Cotswolds Conservation Board have teamed up with the Hare Trail organisers, including Dursley Town Council to help conserve, enhance, explore and enjoy the special qualities of the Cotswolds Area of Outstanding Natural Beauty (AONB), whilst encouraging everyone from art aficionados and nature lovers to social media snappers to visit new attractions, hidden hills and valleys, quiet corners and busy market towns along the trail including Dursley. Dursley has become the home to 7 Hares including the one pictured which was on display at the Annual Town Meeting recently. Chris and Linda Cherry have been awarded the Leslie D Gale award for service to the community by Dursley Town Council at the annual town Meeting. The award is presented by Dursley Town Council to recognise not only longevity of service to the community but also the impact made. Neil Grecian, Dursley Town Mayor reported to the meeting that he was aware that Chris and Linda have been involved in the town for many years with Vale Vision and the various projects it has been instrumental in including The Sculpture trail, the Health walks and Breakheart Quarry. Chris and Linda were taken by surprise by this award and were particularly pleased by the fact that their nomination for this award was made by Dursley Business Inclusive which represents the traders and business people of the town. Chris and Linda are 3rd and 4th from the left in the picture. Liskeard Spring Community Fair saw the Town Hall packed with stalls representing local charities, voluntary organisations and community groups, with hundreds of people coming through the door to find out what goes on, and how they can get involved. There was a real buzz at the Walkers are Welcome stall with great interest in the ‘Name the local landmarks’ competition – edible prizes were definitely an added attraction! Good fun and a great advertisement for WaW. 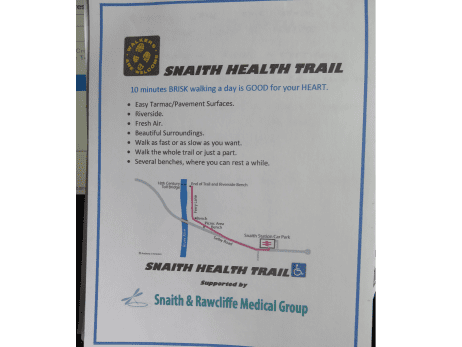 In partnership with Snaith & Rawcliffe Medical Group, The Walkers Are Welcome Group has launched a Health Trail in Snaith, aimed at people recovering from ill health or who feel that regular outdoor exercise will keep them healthy. Leaflets are available at the Health Centre and Chemist in Snaith. It is hoped that people will use the trail and graduate to longer walks, then possibly join one of the short guided-walks that leave the station Car Park at 10am every Tuesday. These offer good exercise as well as social stimulation. Whitchurch, Hampshire Winners of three Community Awards. “Well what a brilliant Community Day event with Whitchurch Walkers are Welcome members scooping three out of the six special 25th Anniversary Community Awards in recognition of their tireless work and commitment to the town and the North Hampshire countryside! 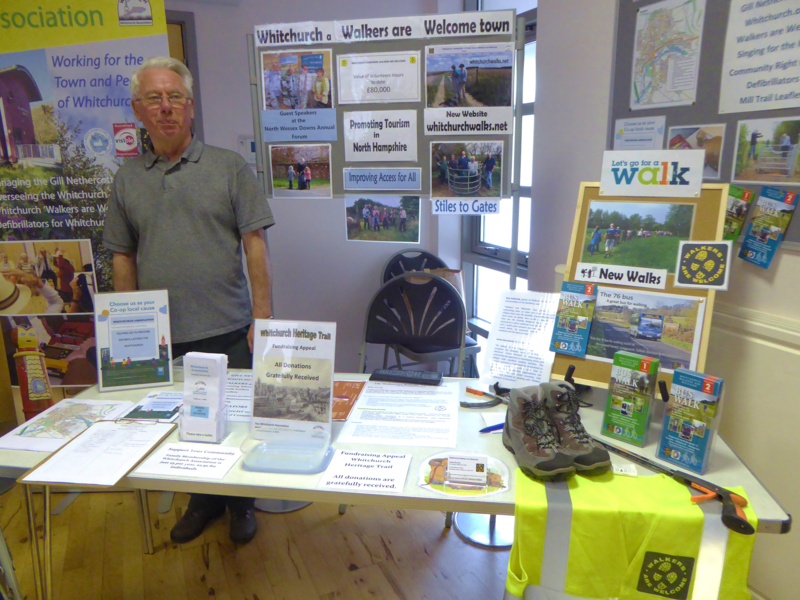 It was great to chat about Walkers are Welcome to so many interested locals, the new bus walk leaflets proved particularly popular and we even managed to sign up a few new volunteers! Henley-on-Thames has been accredited as a Walkers Are Welcome Town, the second town in Oxfordshire to achieve the status. It has much to commend is as a destination for walkers. It is on two long-distance paths: the Thames Path national trail and the Oxfordshire Way, as well as the Chiltern Way Berkshire Loop and the Wokingham Way. It is on the edge of the Chilterns Area of Outstanding Natural Beauty and is at the hub of a rich network of well-marked paths. The town itself is on the railway and is on a bus service to Reading, High Wycombe and Oxford. It has a host of cafés, hotels, pubs and bed and breakfasts, all ready to welcome walkers. 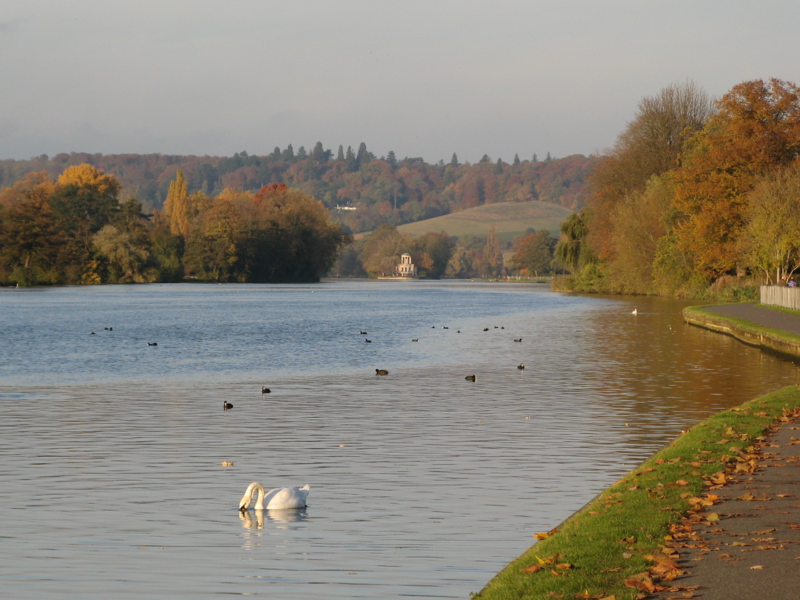 The town’s committee hope to persuade the Great Western Railway, Salters Boats and the local bus companies to cooperate in enabling walkers to come to Henley and to use the services to enjoy linear walks. There is plenty to see and do in the area, including the National Trust properties of Greys Court and Nuffield Place, the River and Rowing Museum and the Kenton Theatre. The committee includes people who are active in the Ramblers, the town council, the visitor centre, the Chiltern Society, local businesses and Nordic walking. Visit the town to enjoy a quiet walk by the river or the bluebell woods of the Chilterns, or venture further onto the Chiltern escarpment for fine views. There is plenty of variety and interest. Dursley Welcomes Walkers members were on hand to assist at the unveiling of the new plaque in Dursley that celebrates the contribution to Dursley that Listers made. The iconic engineering company, founded by Robert Ashton Lister (later Sir Robert) in 1867, was a major employer in the town for many years. 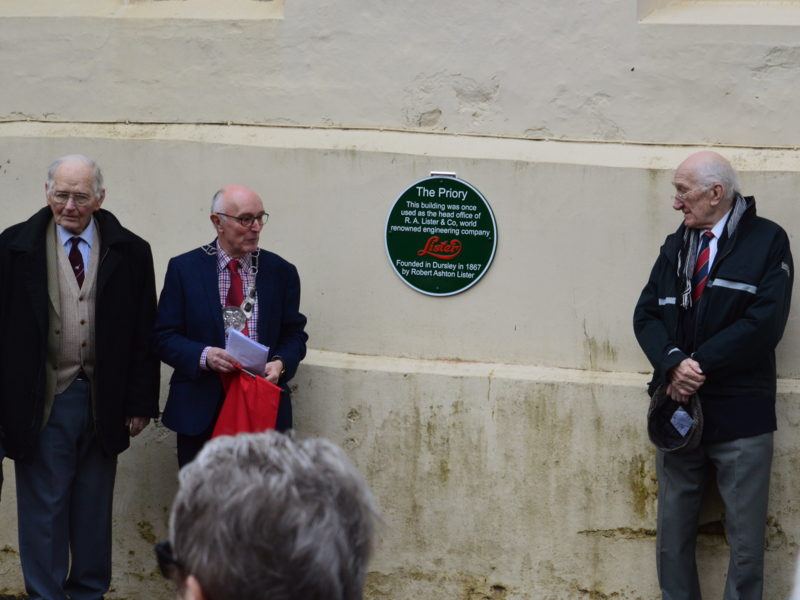 In order to recognise the importance of Lister’s to Dursley town a plaque was unveiled at the Priory on the 7th April by the Mayor of Dursley/secretary of Dursley Welcomes Walkers, Councillor Neil Grecian. The event was attended by many former employees of the company, many local residents and members of the Lister family. Fisherman’s Bridge on the upper Lune, was destroyed in December 2015 during Storm Desmond, along with Birks Bridge on the Rawthey and a section of footpath, also on the Rawthey, near Brigflatts. As a result, three footpaths needed diverting, including sections of the recently established Sedbergh Quaker Trail. However, as of the beginning of this year, the path network around Sedbergh is entire again. “Fisherman’s Bridge on the Lune near Goodies had stood for 60 years. A county surveyor’s note stamped 16 July 1957 recorded that it cost £363 7s 10d (£363.39). After Storm Desmond, only the stumps of the four piers on the riverbed remained of the old structure. The new bridge cost £110,000, with individuals and local groups donating £12,500 to the project – including WMB Trust, FoLD, Yorkshire Dales Society in memory of John Willson, John Hatt, Ramblers Lake District Area, Kendal Group and Lancaster Group, The Dales Way Association, Sedbergh Parish Council, Sedbergh Anglers, Sedbergh Walking and Cycling Group, and Richard & Dorcas Thomas. The 35 metre long bridge was a year in the planning and took eight weeks to construct. The new bridge was designed with only one pier, to create less obstruction to flow during flood events. A total of 22 steel beams, each weighing 130kg, were bolted together to span the river and support a wooden walkway. Cumbria County Council Contractors constructed the stone clad piers and wooden steps. The Yorkshire Dales National Park Authority constructed the bridge itself. The bridge was almost lost during a period of heavy rainfall on 22nd November last year when the river level rose in excess of 4 metres. This force of water pressed against the scaffold which was swept away, and bent the bridge sideways and downwards on the longest of the two spans (23m length). Fortunately this remained attached and the scaffold was salvaged. Luckily the project had been insured by the YDNPA. I should like to pay a special tribute to David Clare who craned the damaged bridge off the piers, repaired it in the adjoining field and then craned it back on to the piers, all within two weeks of the damage being done. The bridge recreates the link between Firbank (part of the new extension to the YDNP) and Howgill. It is an important link as it is the only footbridge across the River Lune for miles in each direction, the nearest crossings being road bridges at Lincoln’s Inn on the A684 and the Crook of Lune Bridge to the north along Howgill Lane. In fact it is the only publicly accessible footbridge over the River Lune between Kirkby Lonsdale and Tebay, a distance of over 30km. 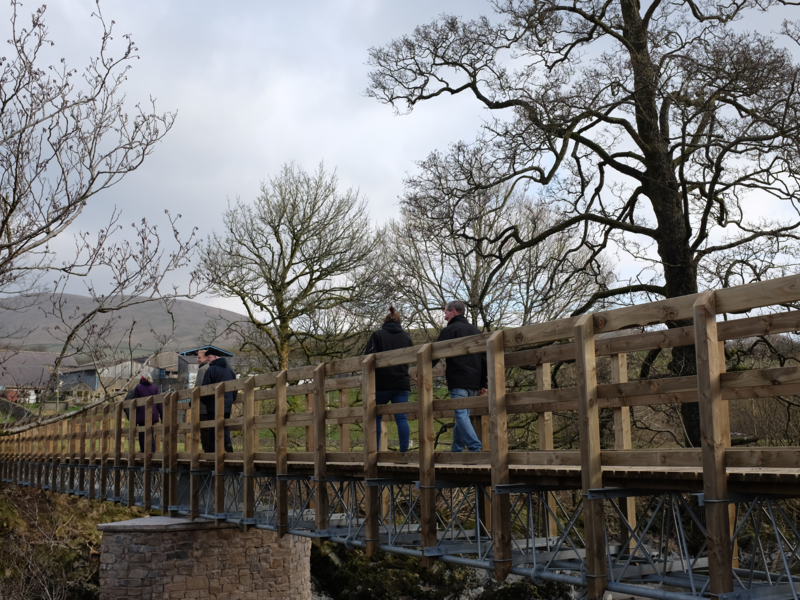 The new bridge is on the route of the ”Sedbergh Quaker Trail”, which was devised by Dave Smith of the Sedbergh Area Walking and Cycling Group and supported by the Sustainable Development Fund. The trail is described in booklet available by post at the Sedbergh Information Centre on Main Street, Sedbergh, telephone: 015396‑20125. Further information about walking in the Sedbergh area can be found on the Walking and Cycling Group’s website: www.sedberghgateway.org.uk. The Bradford on Avon WAW walk leaders were often asked at the end of their walks whether a map of the route could be made available so people could follow it at their leisure. So we started to consider how we might do this. 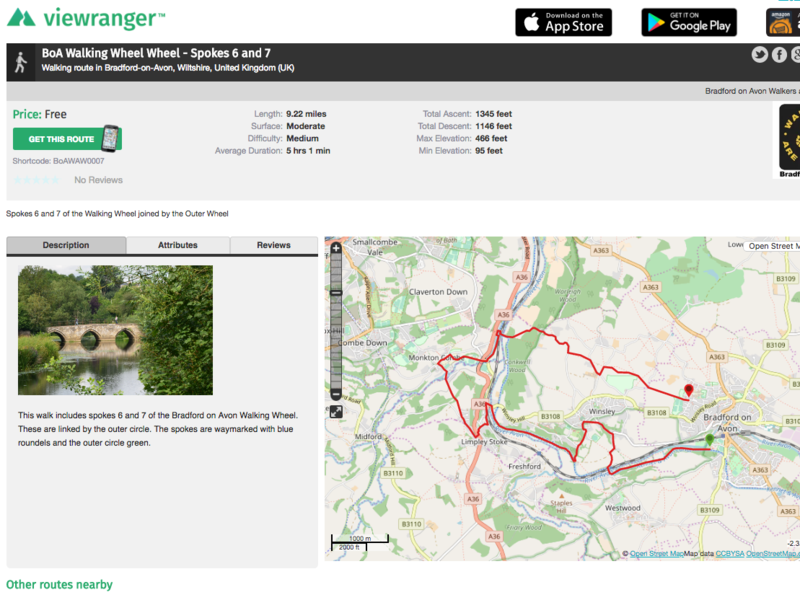 Two of our regular leaders were using ‘Viewranger’ on their smartphones and suggested we give it a try. We did and liked what we found so decided to start using it. So, what is Viewranger? It’s a free to download smartphone app that can be used on desktops and tablets as well as smartphones. You can use free Open Street Maps or pay to download tiles of OS 1:25,000 and 1:50,000 maps. It’s very flexible and adaptable. You can set it to record a walk you are doing – it works by GPS so wifi signal is not required, you can plot a route to follow using your desktop, or you can follow someone else’s route. We try to record all of our regular monthly walks and share them in our monthly newsletters. We are also building a suite of walks on our website: www.walkbradfordonavon.org/viewranger-walks. If you’re in the lovely Bradford on Avon area of West Wiltshire, just 10 miles from Bath and would like to walk The Wheel but would prefer a paper map, a 1: 16,000 version can be bought at our Tourist Information Centre, Ex Libris bookshop, Town Library or Holidays and Cruises Travel Agents. They are laminated, fold up small enough to fit into a standard pocket and are very durable – a bargain at £5 each.